The Semifinals of the 2015 Samsung Cup took place on November 3 to 5, 2015. The venue was the Samsung Global Research and Development Center in Gyeonggi, Korea. Lee Sedol 9p was faced to Ke Jie 9p, and Shi Yue 9p was played against Tang Weixing 9p in the semifinals. Ke Jie 9 dan (left) and Shi Yue 9 dan proceeded to the final of the 2015 Samsung Cup. Lee Sedol 9 dan (left) and Ke Jie 9 dan at the 2015 Samsung Cup. Ke Jie became the new #1 in China two months ago, and he’s ranked #2 in the world according to Dr Bai Taeil’s rating system, which is used by the Korean Baduk Association. He won the 2nd Bailing Cup in January this year, and he is regarded as the post Gu Li in China. Unbelievably he’s undefeated as White in official games in 2015, and he is the most powerful player in the world at the moment. Lee Sedol is ranked #2 in Korea, and he’s ranked #3 in the world. He won the 27th Asian TV Cup in August this year, and he’s been in good form this year. Tang Weixing 9 dan (left) and Shi Yue 9 dan at the 2015 Samsung Cup. On the other hand, Shi Yue is #2 in China. He’s held #1 for more than a year, but he went down two months ago. He won the 17th LG Cup in 2013, and he is still one of the most powerful players in the world. Tang Weixing is ranked #10 in China, but he’s done very well in this Samsung Cup last two years. He won the 2013 Samsung Cup defeating Lee Sedol, and he was the runner up last year. He proceeded to the semifinals this year as well. Ke Jie 9 dan at the 2015 Samsung Cup. 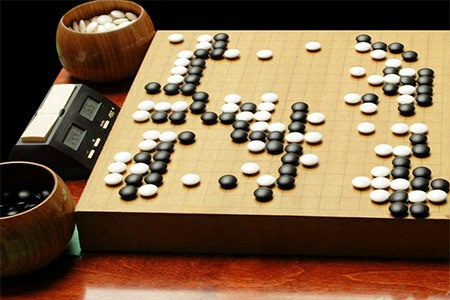 Lee Sedol and Ke Jie’s semifinal is regarded as the most spectacular match in 2015 by many Go fans. They have never played each other, and that’s one of the reason why this match was highly regarded. However, unfortunately, it wasn’t that interesting as anticipated. Ke Jie showed his ingenious potential in the semifinals, and he defeated Lee Sedol smoothly. In game 1, Ke (White) overwhelmed Lee from the opening, and he managed his weak group from the right side with excellent technique. Lee invaded White’s the top area, but Ke’s moves were accurate and bold, and the game was decided. I couldn’t find any of Ke Jie’s mistakes in that game, and his play was flawless. In game 2, Lee made a big mistake on the right side, and Black took the early lead by Black 37. White 42 was slack, and Black’s sequence at the top was natural and efficient. Black 57 was a sharp invasion, and Ke took the clear lead. Once Ke was ahead, he played solidly and safely, and he didn’t give Lee any chances to catch up until the end. Many of his fans were disappointed that he didn’t show his typical dynamic and powerful moves in those games. Throughout the semifinals, Ke showed his special power and strength, and the most impressive thing is that he didn’t play any clear mistakes in those games against Lee Sedol. Lee Sedol is very talented at provoking his opponent’s mistakes by his tricky moves based on his powerful and accurate reading, but it didn’t work against Ke Jie. Hopefully, Lee will soon come back with his typical style of play. Shi Yue 9 dan at the 2015 Samsung Cup. On the other hand, Tang Weixing had a nice start with his victory of first game of the best three match. In game 1, there was a huge ko at the top, and Tang took the lead with the big trade up to Black 105. Complicated fighting was continued after that, and eventually Tang captured White’s big dragon in the center, and the game was decided. However, Shi quickly changed the mood in game 2. Tang invaded Black’s formation at White 18, and Shi started to capture that stone immediately. The game became very tense and complex with a huge real life and death problem at the bottom. Tang made a ko with White 70 with his skillful moves, but Shi didn’t retreat, but kept on going to kill White’s bottom group. Black eliminated the ko, and White started to capture Black’s bottom group from White 88, but Black’s sequence from Black 89 to Black 109 was exquisite, and the game was finished at the same time. In game 3, the game was very difficult with fierce fighting from the beginning. White started fighting from White 40, and the following fighting was endless. Tang tried to capture Black’s center group severely from White 122 and the center group became in great danger. However, White missed to exchange G6 for Black G5, and Black 163 to Black 167 formed a brilliant counter and the game was suddenly decided up to Black 173. The Samsung Cup first started in 1996 and uses a rather convoluted draw. Though, arguably, it is fairer than a straight knockout format. The 32 players in the main draw are split into 8 groups of 4. Players must win two games in order to proceed from the first stage; two players from each group will advance to the knockout stage. In some ways it’s similar to the group stage of the FIFA World Cup, except that only two wins are necessary to continue. The round of 16 and the quarter finals are played as a straight knockout. The semifinals and the final are played as best of three matches. The time limit for games is 2 hours and 5 x 1 minute byo-yomi. Samsung is a well known Korean conglomerate.